I need your help. I want to remove the glue on the on the plastic model after I have put the glue on the pig ear to hold it in place. I have snapped it when I fell over on the door step as it was an accident. When I sealed the glue on pig ear to hold it, i saw there is a glue coming down from the top while I hold it. I tried to wash it off using with the hot water but I couldn't be able to get it off because it got dried so it was too late. I don't mean to be funny but this is my mum and it wasn't mine. 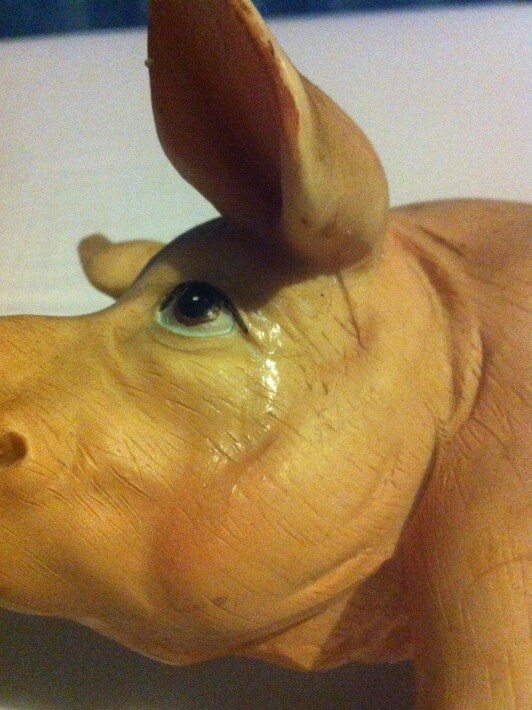 Do you know how I could be able to remove the glue on the pig face without cause any harm to the paint on the plastic model? TBH, removing the glue is a losing proposition. It's only visible because it's glossy anyway. Put some matte varnish over the glue and call it done. Scraping will remove paint, any chemical that can remove glue can also remove paint. When reparing damage, its best to paint match. Using blue tack or putty, you can protect some of the area around where you need to glue, but its dicy at best. In the end, if you can colour match, scraping may be am option -- but you cam damage the project if not careful.